an approach to finding novel antibiotics. [2016-08-29] Crystal structure of the Rox protein has been solved by Liu et al. (PMID:27557658). [IMPORTANT] Nucleotide sequences of pNV vectors have been updated. An ordered plasmid library was constructed from the large-insert shotgun library (KNL) used in the genomic sequencing. Available clones are listed here. Please request plasmid DNA via e-mail (up to 10 plasmid DNAs at a time). Low and high copy-number vectors are available. The strain IFM 10152 is available from Medical Mycology Research Center, Chiba University. Other papers are listed in here. What's Nocardia. Nocardia species are Gram-positive bacteria which grow in soils as well as animal tissues. They can cause a disease in humans, nocardiosis. Since treatment for nocardiosis heavily relies on chemotherapy, their intrinsic multiple drug resistance is a serious problem. On the other hand, some species of Nocardia are known to produce antibiotics and aromatic compound-degrading or converting enzymes. Recently, Nemoto et al. discovered an antibiotic, asterobactin, from a clinical isolate. To elucidate the molecular basis of the versatility of this organism, we determined the nucleotide sequence of the genome of a clinical isolate Nocardia farcinica IFM 10152 by whole-genome shotgun strategy. Why farcinica. Taxonomy of Nocardiae is complicated, especially in "asteroides-complex". Many strains of Nocardia have been moved to different genera or species so far. However, the species N. farcinica was found to be nearly homogeneous (Laurent et al., figure). 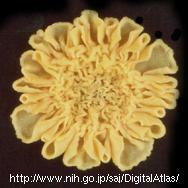 In addition to this, recently, N. farcinica is the most frequently isolated species in Japan. How determined. We constructed small- (2 kb) and large-insert (10 kb) genomic libraries, and generated about 115,000 sequences (giving 9.5-fold coverage) from both ends of the genomic clones. The sequence data were assembled by using PHRED/PHRAP/CONSED package and in-house scripts. Sequence gaps were closed by transcriptional sequencing and primer walking. The final gap was closed on 2 Sep., 2003 (my birthday:-). Genes were annotated by using GLIMMER, BLASTP, FramePlot, tRNASCAN-SE and in-house scripts. 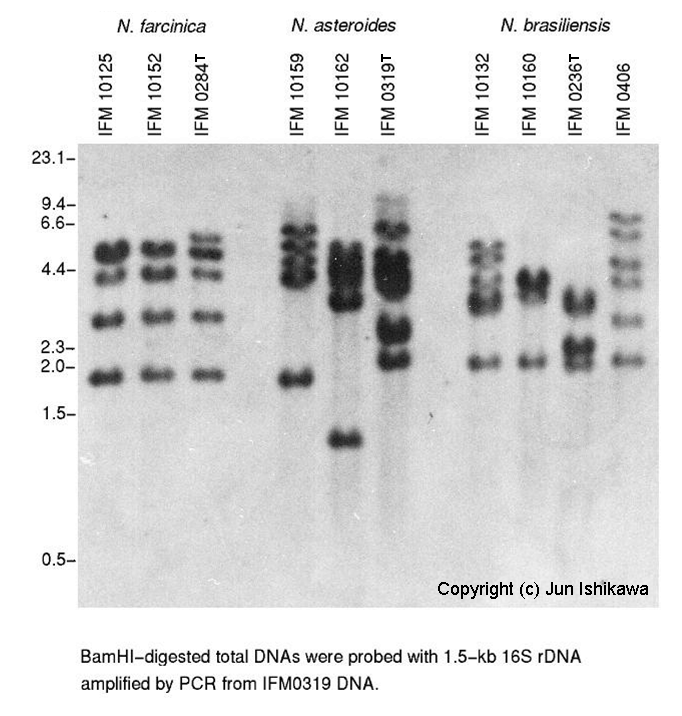 *The copy numbers of pNF1 and pNF2 were estimated from the statistical distribution of random reads between the plasmids and the chromosome. The most famous model strain of Streptomyces. Please remember that this strain taxonomically belongs to Streptomyces violaceoruber. Don't mistake S. coelicolor A3(2) (e.g. ATCC BAA-471) for S. coelicolor (Müller) (ATCC 23899)!! An erythromycin producer. circular chromosome. Causative agent of bronchopneumonia in horses. The complete sequence without annotation is available via FTP. Belongs to Frankiae. Draft genome sequence with annotation is available. is a derivative of FramePlot, and helps identification of protein-coding genes by using the codon usage of organisms you interested. is a web-based support tool to find secondary metabolite biosynthetic gene cluster.